Thad Lewis looked good last week. And of course, he got hurt. So what did the Bills do just in case? They signed Matt Flynn! Yeah, that Matt Flynn. Jeff Tuel is off in a corner somewhere deep in the depths of Buffalo's training facility because he knows that they hate him so much. Anyway, it is because Lewis was much better than anyone expected, that I lost my pick of the Bengals, which looked really easy when I made it. The Jets...wow was that a bad loss. The Broncos played an awful game (by their standards)...and they still won by 16. Unfortunately, they were supposed to win by at least 26 for me to get a push, but we can't have that now can we? I'm officially never falling for a line that big again. Until of course clearly the best team in the league, with an unstoppable offense that is hanging up 44.2 points per game (including this "letdown") is facing the worst team in the league, with a gruesome defense..at home! Forget 26, how did they not win by 126? The inconsistent Chargers struck again, beating the Colts for seemingly no reason on Monday night. Good job San Diego, thanks for being absolutely impossible to predict. And boy was I worried about that one. The Cards have been decent so far, and playing at home gave me some pause at to who to pick. Not to long after I made the pick, the line went up to 5 or 5.5 depending on where you looked. I very well could have been sucked into taking the Cardinals had I seen that. Either way, I'm now 5-2 on Thursday night games, and after a mediocre Week 6 record (I went 7-8), I'm sitting at 50-43-2 on the year. I consider that to be pretty impressive after two bad weeks in a row. Buccaneers (+7) over FALCONS. I can't believe I'm picking Mike Glennon on the road. Anyway, the Falcons are barely good at one thing, offense. I say barely because Julio Jones is on IR, and Roddy White isn't playing, leaving Matt Ryan with Tony Gonzalez and Harry Douglas to throw to. When you take into account how good the Bucs defense is, which is mostly why I called them the eighth best team in the league before the season (remember, this was before Josh Freeman career died. Then was resurrected...we'll get to that later). They can easily take away Ryan's options, and it's really hard to run on Tampa, so two already not-so-great running backs are going up against a tough squad. And Atlanta's defense isn't so hot either, so Glennon should feel pretty good about his chances here. Am I going to pull the trigger? Damn right! UPSET ALERT. Bengals (+3) over LIONS. The Bengals are good. They should keep it close. Bills (+9) over DOLPHINS. Oh come on! While it's totally plausible for the Dolphins to win by 10, I wouldn't count on it. Like I said among Thaddeus Lewis looked fine last week against a tough Bengals defense. A Bengals defense that is much tougher than that of Miami. Patriots (-3) over JETS. There's a chance that my Jets pull off the upset, but they are too inconsistent for me to count on that. EAGLES (-3) over Cowboys. I don't feel good about this, but I feel like I have to pick the Eagles here. Without DeMarco Murray, and with a seriously hobbled DeMarcus Ware, Dallas will be without key players on both sides of the ball. That's going to be an issue in this particular road game, but I still think the Cowboys are the better team. Chargers (-7) over JAGUARS. Speaking of confusing teams, the Kings of Inconsistency make me nervous every time I try to pick one of their games. But the Jaguars are so bad that I feel comfortable laying a touchdown on the road with the Bolts. 49ers (-3) over TITANS. Jake Locker's return made me think about this game some more, but ultimately the Niners are the better team. It will be closer than one might expect, but they'll pull it out. Brandon Weeden On The Road (+11) over PACKERS. Even though it's Brandon Weeden On The Road, this line is too high. Usually, any line between 10 and 73 is acceptable for Brandon Weeden On The Road, but the defense is really good. Without Randall Cobb, Joe Haden will lock down Jordy Nelson. It looks like James Jones will be missing here as well, leaving Aaron Rodgers with Jermichael Finley and Jarrett Boykin to throw to. Jarrett Boykin! CHIEFS (-6.5) over Texans. The Houston fans who cheered Schaub's injury, go fall down a flight of stairs. Or walk into oncoming traffic or something. I'm sure Matt Schaub would gladly stand there are applaud your pain. Anyway, it is because of Schaub's injury that the greatest QB in the history of college football, Case Keenum, is starting for the Texans. He holds the NCAA records for passing yards, passing touchdowns, and completions. Unfortunately, being so good in college means nothing against not just any defense, but probably the best defense in the league...with a great pass rush...on the road. Good luck Case! Ravens (+2.5) over STEELERS. Unlike in previous years, this matchup is not going to be a classic. The Ravens offense is flat out bad right now, since they can't even run the ball with Ray Rice anymore. Their defense is still pretty good however, and their pass rushing duo of Elvis Dumervil and Terrell Suggs should wreak havoc on the Steelers offensive line. Of course that;s what I said about the Jets pass rush against the Steelers last week, but I don't see Pitssburgh's line holding up two weeks in a row. The Steelers are overall not that good, so this game may end up with a final score of 3-2. Boy will this be a display of absolutely disgusting football, but the Ravens are clearly better. UPSET ALERT. Broncos (-6.5) over COLTS. I don't trust the Colts defense here. I usually don't trust them, and I don't trust teams against Peyton Manning, so that's a bad combination. As great as Andrew Luck has been, Pep Hamilton needs to stop with his stupid power running game. Trent Richardson is an average running back, and Andrew Luck is clearly one of the best quarterbacks in the league. Does this make any sense Colts fans? I'd love to hear what you think every time Luck stuffs it in Richardson's belly and watches him fall forward for 3 yards instead of dropping back and unleashing a bullet to T.Y. Hilton, Reggie Wayne, or Coby Fleener. Anyway, that running scheme won't work against this pretty good run defense (they're statistically the best in the league, but those numbers are inflated because they are ahead most of the time). That means more of Andy Luck, and that's a plus. You get to see Manning and Luck trading blows, and in his homecoming, the G.O.A.T. should win this. For me, the jury's still out on the Colts. I don't know what they are. They're probably winning their division by pure attrition, but I don't know if they are one of the elite teams. Vikings (+3.5) over GIANTS. All in on Josh Freeman!!! Let's go! Out of that toxic situation in Tampa where the coach tried everything in his power to diminish Freeman with a silly smear campaign. Look back at how much attention was given to stories about Freeman, because Schiano made them into big stories. 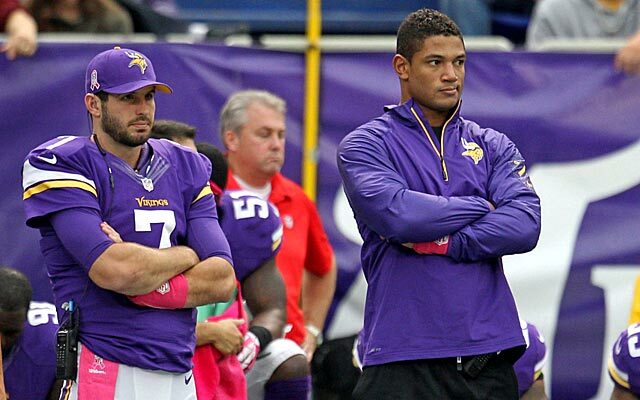 Now he's free, and he knows that this is his time to prove to everyone that he is 2010 Josh Freeman. Because I loved 2010 Josh Freeman. These past three years I've been waiting for that guy to return, and he has, and then he vanished randomly and turned into the putrid, 2013 Josh Freeman. I need my boy back! And guess what? Against this Giants defense, he's going to come back strong. Don't get me wrong, the Vikings are a bad football team, but the Giants are probably worse. UPSET ALERT. FREEMAN ALERT.